1. Power Editor and Ads Manager Are Now One. 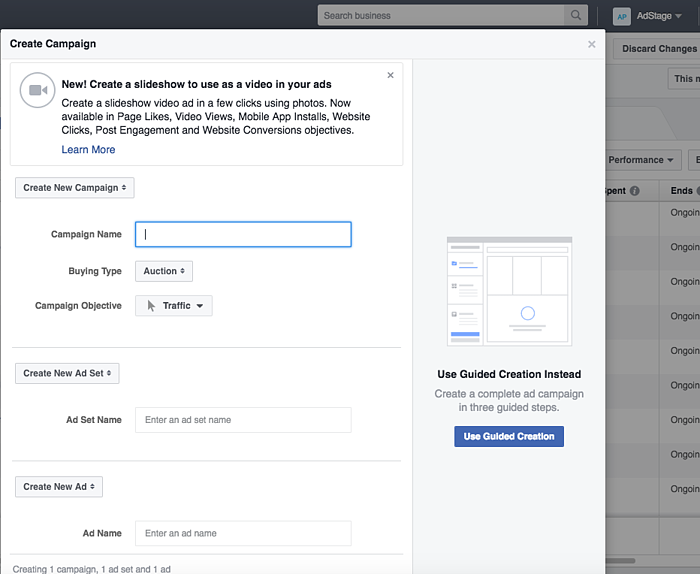 Starting this week, advertisers will begin to see an updated Ads Manager interface. Here’s what you need to know about this update. The updated Ads Manager will look just like its old version, plus all the features from the old Power Editor and Ads Manager. Quick or guided: choose your favorite creation flow. Whether you preferred Power Editor’s quick creation or Ads Manager’s guided creation, you'll be automatically opted in to the same workflow you used previously. You can change it anytime in the top right of the ad creation window. Automated drafts: review and publish. You’ll still have access to the Power Editor’s Automatic drafts feature. However, you will now manually review and publish all the changes that need to go live. Nothing to worry about: if you leave the updated Ads Manager with unreviewed changes, Facebook will show a reminder. All campaign data insights and reporting in a single interface. The updated tool will allow advertisers to view and report on campaign data within one interface. 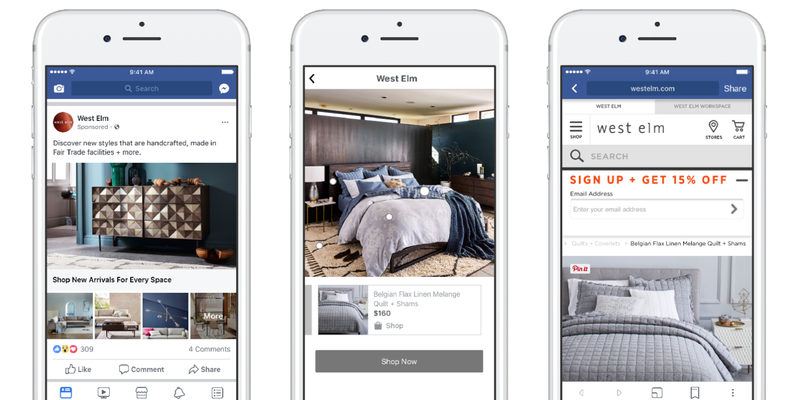 On Monday, Facebook announced a new ad format which allows users to shop directly from the Facebook ad. 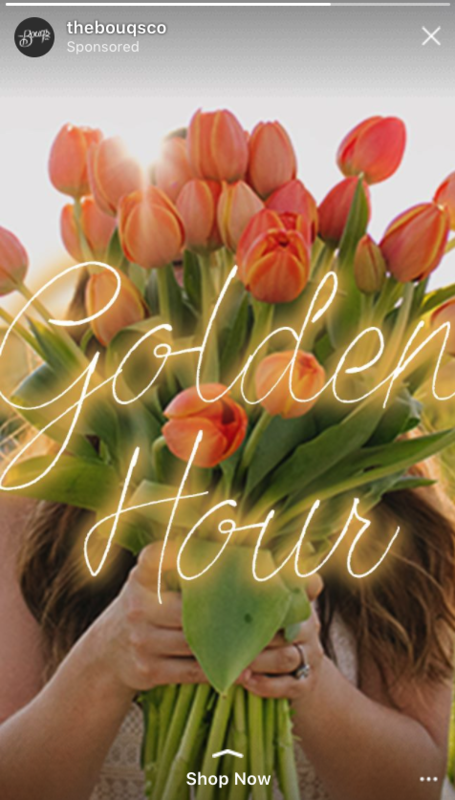 The new ads carry the look of a modern-day print catalog: not as glossy, but with the added benefit of interactivity, mobile reach, and less consumer friction. The new lifestyle format should appeal to the Pinterest demographics (Williams-Sonoma was among the first brands to test these ads in beta). On Tuesday, Instagram announced the integration of Instagram Stories with Facebook Canvas. Canvas ads can now run in Instagram Stories. What does it mean to advertisers? 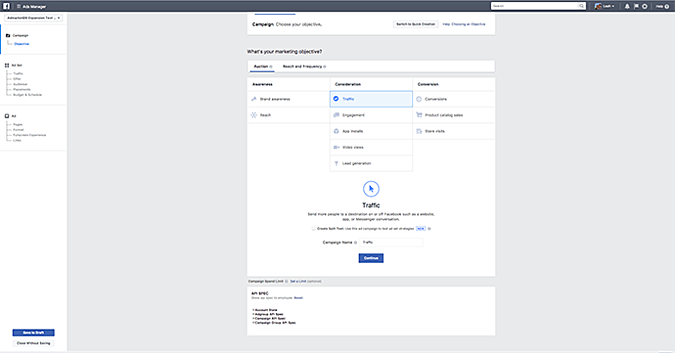 Broader reach: you can now run the same Canvas ads across Facebook, Instagram, and Audience Network. On Wednesday, Facebook introduced monetization eligibility standards. Which means Facebook will now be more selective and cautious about Branded Content and Instant Articles. The new guidelines will control who is eligible to earn money on Facebook and what kind of content can be monetized. Starting today, the update will apply to videos and will extend to Instant Articles over time. You knew this was coming. Brand safety and ad fraud are major issues for advertisers. How do you make sure ads don't show up next to questionable content? And who is clicking, a bot or a human? Facebook has been under scrutiny this year: first, fake news, and then inflated ad reach numbers. Facebook’s new two-second video buying option. To ensure advertisers have better control over brand safety, Facebook will work closely with third parties, such as DoubleVerify and Integral Ad Science. As Facebook is looking to make more ad money on its original content, these changes will be critical to rebuilding the network’s trust with advertisers. Facebook is testing a new feature called Facebook Instant Videos. Facebook Instant Videos download and cache Facebook videos to a user’s phone while they’re on WiFi so that they can watch them later on the go without spending their cellular data. Instant Videos could be a game-changer for advertisers in the developing countries with a slow mobile Internet connection. For places where mobile data is pricey, and the network is weak, the new feature can level the playing field -- at the very least when it comes to ads. For example, the average download speed on cellular in Afghanistan is 2.2 Mbps, compared to 4.4 Mbps in South Korea. While it’s clear from some of the earlier updates that Facebook will continue to focus on Instant Articles (and videos), this ad format will no longer be available on Messenger -- for now. The truth is, as of now, Instant Articles are still not as publisher-friendly as Facebook wants them to be. Publishers report traffic issues; according to TechCrunch, advertisers have also complained about attribution: you can’t easily add UTM parameters to the end of Instant Article URLs. Facebook is collaborating with publishers to give them more control over their content, so maybe we'll see a comeback. To top this week's updates, Facebook also launched a new video chat app called Bonfire. The app mimics all the features of Houseparty, a social network popular among teens. Facebook's copycat strategy is strong and already caused Snap's earnings to plunge in the first quarter. Which app is next? Tune in to hear the experts’ commentary on AdStage’s PPC Podcast this Friday.